“`Once you’ve revisited the cinematic depiction of Bedford Falls in It’s A Wonderful Life, you will be able to have a cocktail in a pop-up bar that recreates the movie’s post-World War II-era charm. Fitzgerald’s in Berwyn (off the Oak Park Blue Line exit) is turning their side bar into a recreation of Nick’s; the rough-and-tumble pub that exists in the alternate universe of Bedford Falls where George Bailey was never born. “`They will feature an antique cash register, complete with a bell awarding angels with their wings; impromptu sing-alongs to Auld Lang Syne; and a raffle at the end of each evening, with tickets drawn from a giant wicker basket. “`Bartenders serve a menu of cocktails inspired by It’s A Wonderful Life that are available in the tavern. These creations include the Flaming Rum Punch ordered by the guardian angel Clarence Odbody, and a drink called Zu-Zu’s Petals. Just like Nick’s depicted in the flick, the bar will also serve hard drinks for men who want to get drunk fast. 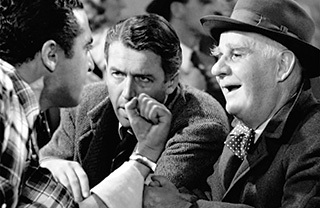 “`The It’s A Wonderful Life–themed pop-up bar takes over Fitzgerald’s every Wednesday in December beginning at 5p. Show up early to listen to a jazz ensemble performing holiday standards; and perhaps a version of Buffalo Gals. Stick around to watch It’s A Wonderful Life in all of its black-and-white glory at 8p; with no commercial interruptions, of course. “`Another banner day at the Bailey Building-and-Loan… so to speak. This entry was posted on Tuesday, November 28th, 2017 at 10:13 pm	and is filed under Blog by Manny Pacheco. You can follow any comments to this post through the RSS 2.0 feed. Responses are currently closed, but you can trackback from your own site.